The CW has become the predominant home of DC Comic properties and has added yet another show to its library in Supergirl's move from CBS. It only makes sense then that DC Collectibles would add a few more CW themed heroes and villains to its action figure line (via Toyark). First up are the three debut releases from Legends of Tomorrow, which include Firestorm, Hawkgirl, and The Atom. Firestorm comes with interchangeable hands, including a few with fire effects. He also comes with an alternate head. The Atom sports 6 interchangeable hands with multiple add-on effects, and Hawkgirl sports four switchable hands and her trademark mace. Next up is Supergirl, which will include Martian Manhunter and Kara herself. Both come with four swappable hands. The Arrow line sees two new additions in Vixen and Constantine, and The Flash will get a featured villain in Zoom, who sports 6 alternate hands. 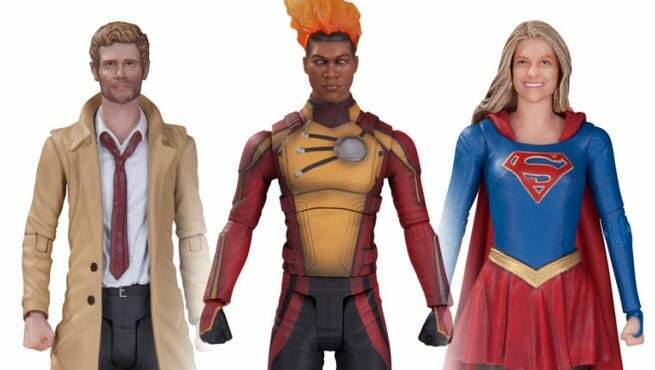 The Firestorm, Vixen, Martian Manhunter, and Constantine sculpts are really well done, but the Supergirl sculpt bears little likeness to star Melissa Benoist. Firestorm and Hawkgirl are available in February 2017, while Supergirl, Martian Manhunter, Vixen, Constantine, and Zoom are available in May of 2017. No specific date has been listed for The Atom. You can see the photos in the gallery.